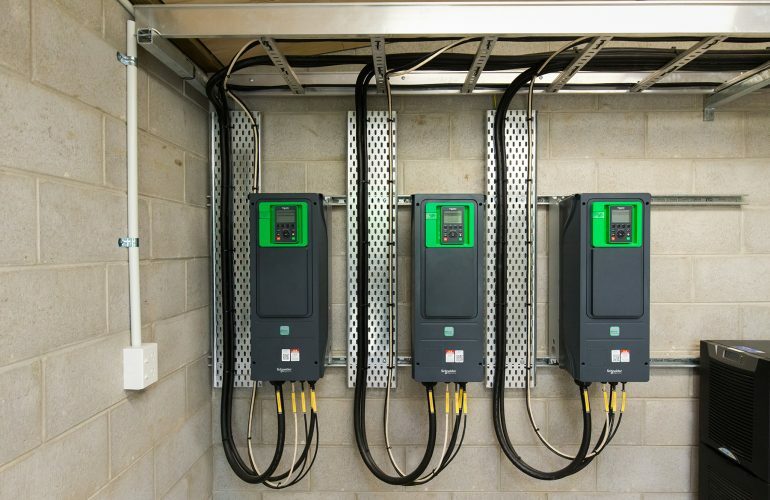 One Electrical were engaged by the Hamilton City Council to relocate the existing Electrical and Control Systems to a newly built electrical room at the Dinsdale Water Reservoir, Hamilton. The reservoir previously had a Pump House with a Motor Control Centre, Power Distribution, PLC, UPS and generator connection panel. It also had all the mechanical equipment and pipework. The amount of equipment in the room had grown over the years and the environment was no longer conducive to equipment longevity. Lack of space proved difficult to work on equipment due to space restrictions. With the construction of a new dedicated switch-room, we upgraded the service mains, increasing capacity, designed and installed a new Motor Control Centre/Distribution, PLC and Communications cabinet. The two existing pumps were upgraded to 11 kW and a third pump added all of which are now controlled by VSD’s. A new 15kVA UPS and integrated UPS changeover switch/DB was installed. The MCC incorporated an Automatic Transfer Switch for changeover to Generator supply in event of a power failure. An HMI provides an interface to the plant for operators and maintenance staff while at site. During normal operation, the site is unmanned and observed remotely by the Hamilton City Council Waters Team. The existing documentation for the site was limited so One Electrical provided a working set of CAD Electrical Drawings for the build, followed by an As Built set. A complete set of handover documents were supplied to HCC including I/O allocation, device types and specifications, Device TAGS, User Manuals and Certifications and As Built Electrical drawings. Cables and cable supports were installed to industry best-practice methods, with full labelling of cables and conductors. The transition from existing to new was completed over a period of three weeks, while the reservoir remained fully operational. The project was completed without any unexpected plant failures or shut-downs.